Greeting card sketches and greeting card designs are sometimes used synonymously. In some worlds, they mean the exact same thing, while in other realms, they don’t. 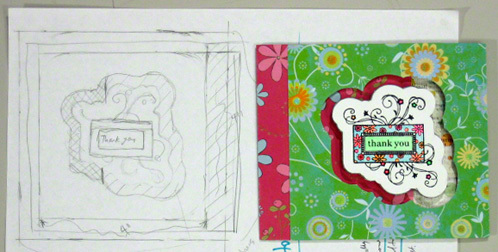 Basically, greeting card designs are templates that start out as ordinary scribbles and sketches. This means, if you don’t have design layout templates to work with, then you can sketch yours from scratch. Don't want to sketch from scratch? Not to worry, we have lots of greeting card design templates for you to choose from on this site. Consequently, If you already have design templates which are sufficient, then no additional sketches are necessary. On the other hand, if you need to expand on those designs, then you probably have to create card sketches from those design templates. This is true even though the design layouts may not change. So, what’s so special about card making sketches? 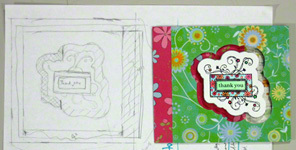 Card making sketches help you create and organize how you want your cards to turn out. Hence, by using them, you avoid mistakes. In turn, this saves you time and prevents stress. For example, this thank you card started out as this single window design template. However, the design template wasn’t sufficient for me to see how the greeting card formats would work. Thence, I expanded on it and created the greeting card sketch you now see at the top of this page. In truth, if your greeting card sketch is not the exact size as the card you want to create, it doesn’t mean you cannot use it. 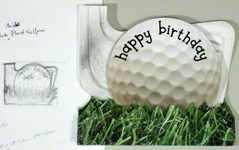 For instance, in this golf birthday card, my sketch was quite tiny when compared to the card. Yet, I was able to make use of it. Apart from this, the sketch included the word "golfer" in the center of the diagram. Regardless, I crossed it out in the sketch because I believed the location watered down the aesthetic effect of the curved letters. Therefore, this tiny sketch helped me prevent a mistake! It is important to point out that, your sketches are usually for your eyes only. That’s why they can be as simple as mere scribbles or as detailed as you desire. For that same reason, you can reuse old materials to create them because no one else is supposed to see them. Now you know why some of the greeting card drawings on this page have unrelated squiggles. When in doubt, repeat the sketch or elaborate on the design. Nonetheless, there are times when the sketches may not be enough to give you the full visual perspective you need. This is when you should consider turning those sketches into greeting card prototypes. So, are you ready to sketch up? Hopefully, you can now see how your greeting card sketches play vital roles in helping you avoid card making pitfalls and stress. Hence, I hope you’ll use them to design and organize how you want your cards to turn out. That said, it’s important to point out that, even though you always need a road-map for how you want your card to turn out, you may not have to draw a sketch for every single card you make. For instance, if you’re using already existing instructions to make your own greeting card, then you probably do not need to create additional sketches. The good news is, this site has a lot of free card making instructions for you to choose from. So enjoy, sketch up, and have fun! Did you notice that the greeting card sketch for this thank you card at the top of this page showed a different opening format than what was used on the finished card? In truth, when I created this card's sketch, I intended for it to have a left handed opening format. However, I changed my mind later to a unique right handed opening format. Yet, I was able to use the same sketch. Not sure what these greeting card formats mean?